With summer approaching, it’s time to bust out the grill and make some healthy and delicious grilled goodies. One of our favorite foods to make during grilling season is this grilled zucchini recipe. 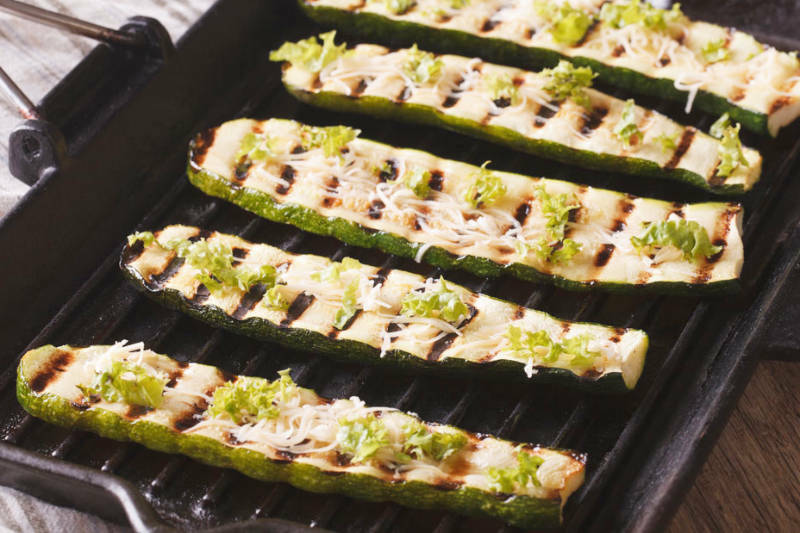 Grilled zucchini, or grilled courgette as the French know it, is a summer food you can indulge in without any guilt. You don’t have to worry about hindering your weight loss goals or losing the beach body you worked hard for all spring long. If anything, zucchini will only bring you some much-needed health benefits. This type of summer squash is loaded with healthy nutrients; it’s full of fiber, vitamins A, C, and B6, in addition to being rich in magnesium, folate, phosphorous, and potassium. Cooked with just a little bit of olive oil, this low-fat recipe is the perfect snack or side dish to enjoy this summer. Cut the zucchini, vertically, into 3 or 4 long slices. If your zucchini is very big, you'll want to cut it into 4 slices. Otherwise, cut it into 3. Lightly brush each zucchini slice with olive oil and season with sea salt and black pepper. Heat up the grill until it's hot. Cook on the grill 4-5 minutes until you can see dark grill marks on the surface of the squash.